The 46th-ish feature film to be written and directed by Woody Allen (are we counting his 1994 TV movie adaptation of his play Don’t Drink the Water), Café Society, a comedy-drama shaken and stirred with some bittersweet romance, is a perfectly fine late-period piece from our most prolific and, yes, still relevant commercial filmmakers. Perfectly fine, but not perfect. 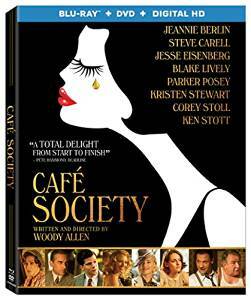 Set in the luxurious New York City and Hollywood of the 1930s, Café Society follows Bronx-born Bobby Dorfman (Jesse Eisenberg, a better Woody surrogate then he was in Allen’s To Rome With Love) as he travels to Hollywood, works for his smooth-talking studio head uncle (Steve Carell, The Big Short), returns to New York to run a nightspot, and then transforms it into the hottest club in town. Along the way, Bobby falls in love twice—first with his uncle’s adorable assistant (a livelier-than-usual Kristen Stewart of Equals), who reveals early-on that she already has a man; then, later, a beautiful Manhattan socialite (Blake Lively, The Shallows), who’s in the position to become the love of Bobby’s life. Though the twisting tale of Bobby’s love life—complete with an unsurprising love triangle and an even less affecting take on the notion of carrying a torch for one’s “true love”—are at the heart of Café Society, the film’s best moments are provided by a handful of supporting characters and cinematographer Vittorio Storraro’s lush depiction of era. Using Sony’s top-of-the-line F65 4K camera (along with its sister, the lighter F55, for use on a Steadicam), Storaro’s work is as once warm, transportive and stunning. And Bobby’s family—his bickering parents (Jeannie Berlin and Ken Stott), good-hearted sister (Sari Lennick, A Serious Man), and happily amoral gangster brother (Corey Stoll, Ant-Man) all offer the pleasures that one associates with wacky family members in five decades of Woody Allen films. There’s also memorable you’ll love it-or-you’ll-hate-it turn with Anna Camp (Pitch Perfect) as a fledgling Hollywood prostitute overwhelmed by Jewish guilt. 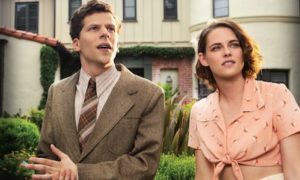 So, Café Society—perfectly fine, not perfect. But that’s okay. Woody, you just keep on doing what you’re doing.